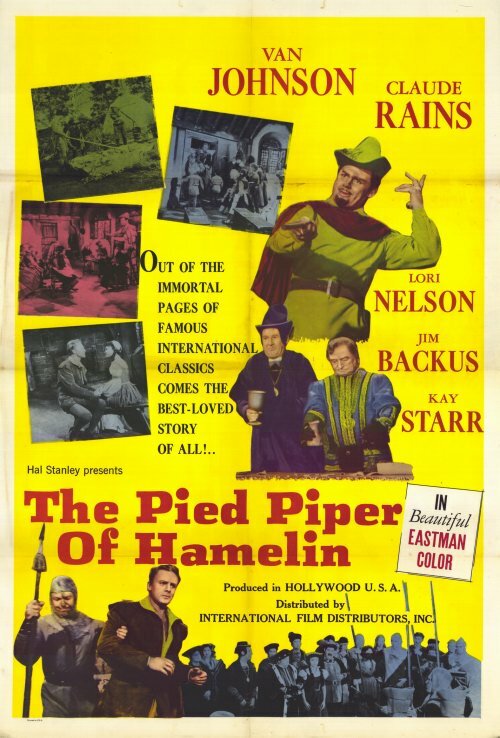 The 1957 version of The Pied Piper of Hamelin is a classic movie treat for all ages. 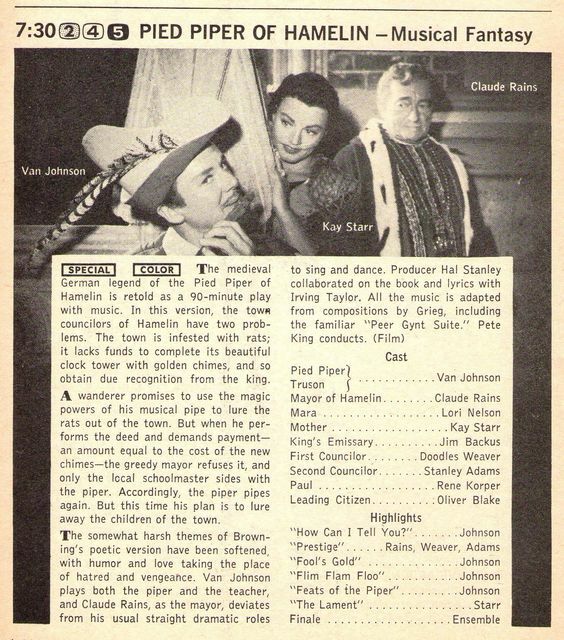 This family musical based on the well-known fairy tale features memorable performances from old Hollywood icons Van Johnson (pictured above with Kay Starr) and Claude Rains, great sets and costumes, and a witty script. The Pied Piper of Hamelin begins when the townspeople of Hamelin and their ambitious mayor (Rains) are planning for a visit from the king's emissary (a hilarious Jim Backus). However, their work is interrupted when Hamelin is invaded by rats. Every effort to get rid of the rats fails, so, in desperation, the mayor and town council turn to a mysterious piper who claims that he can rid Hamelin of rats by playing a magical tune. The music leads the rats to their doom, but, rather than pay the piper his 50,000 gilders fee, the town bigwigs renege on their promise, which causes the magical visitor to take a terrifying revenge. The Pied Piper of Hamelin is based on a German folk tale that is at least partially taken from real events. * Jacob and Wilhelm Grimm included the story in their famous book of fairy tales, and the Victorian writer Robert Browning popularized the story in the English-speaking world with his 1842 poem. 133 years later, NBC executives decided to dust off Browning's version for a lavish family musical that was aired as a Thanksgiving week special. The Postwar baby boom made kiddie programs a guaranteed ratings winner in the 1950s, and the NBC brass hoped The Pied Piper of Hamelin would be as successful of the two live broadcasts of Peter Pan starring Mary Martin and the first TV broadcast of The Wizard of Oz (1939) in 1956. The cover for the soundrack album for The Pied Piper of Hamelin (1957). 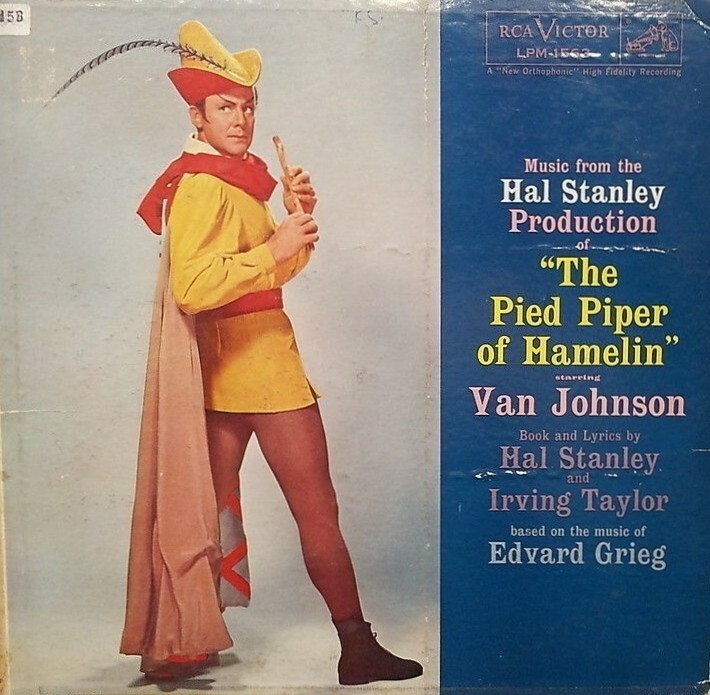 NBC hired Hal Stanley to produce a lavish musical version of The Pied Piper of Hamelin using music from Norwegian composer Edvard Grieg and lyrics by Stanley and Irving Taylor. The movie was filmed in three-strip Technicolor, which was rare for TV during this time period, and NBC hired big names like Johnson, Rains, and Starr to appear in the film. The result was another ratings winner that was rebroadcast in 1958 and then placed into syndication, where annual holiday airings forever imprinted the film in the minds of baby boomers. Viewed today, The Pied Piper of Hamelin has a lot of old fashioned charm. The movie's dialogue is almost entirely spoken in rhyme, which takes a little bit of getting used to for modern audiences; however, once you make the adjustment, the movie becomes a delightful treat that will appeal to classic movie fans who enjoy pictures like the Laurel and Hardy comedy Babes in Toyland (1934) and Chitty Chitty Bang Bang (1968). A promotional piece for The Pied Piper of Hamelin (1957). The production values are top-notch, especially the costumes, and the performances are all first-rate. Johnson is great in a dual role as the noble Truson and the roguish piper. ** (anecdotal evidence suggests that many kids were first introduced to The Pied Piper of Hamelin because their Johnson-crushing moms wanted to see their idol in tight-fitting tights). Kay Starr is also wonderful as a grieving mother whose bravura performance of "A Mother's Lament" is the movie's musical highlight. Future Gilligan's Island-alum Backus injects some much-needed humor into the final third of the film with Mr. Magoo-like antics (he stands in front of a loaded cannon), and a way with dialogue that includes the film's funniest line ("I kept the lady-in-waiting waiting and waiting and waiting"). However, the performance of the film belongs to Rains as the scheming mayor of Hamelin. Old Hollywood fans know Rains from his many wonderful film roles (The Invisible Man, The Adventures of Robin Hood, Now, Voyager, Casablanca, Notorious to name a few), but he was also larger than life on the small screen. In fact, Rains appears to be having the time of his life in The Pied Piper of Hamelin. He spouts verse like he's playing Hamlet at the Old Vic, sings the mayor's signature number, "Prestige," with panache, and he even dances a little (on a table-top no less 🕺). 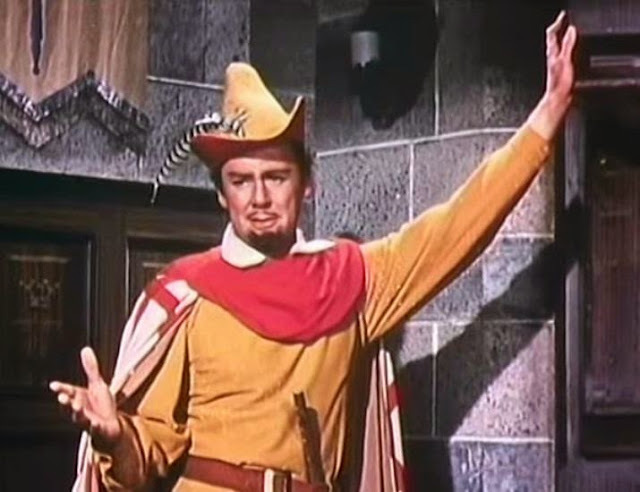 Van Johnson as the title character in The Pied Piper of Hamelin (1957). 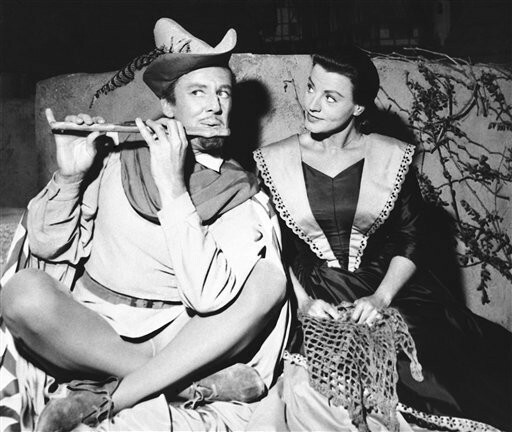 **Johnson became so associated with The Pied Piper of Hamelin that he later played a character called The Minstrel on the sixties Batman TV show (clip here). Fabulous review! Coincidentally, we just found an old copy of a children's book of "The Pied Piper of Hamelin" and my 4-year-old loves it - although I sort of fudge and hem and haw and gloss over the creepy part about the children likely being dead! I've never seen this film, and as a film history buff and ashamed to admit I didn't even know this existed. I'll definitely watch it, and decide if my little one could watch it, also. Thanks! Thanks. This movie does have a happier ending than the fairy tale, but I was on the edge of my seat there for awhile. Van Johnson AND Claude Rains? I'm in! This sounds delightful, especially if the dialogue is spoken in rhyme. Thanks for reviewing this – I don't think I would've heard of it otherwise. You're welcome. It's a delightful film.